“Network Effects”, one of the latest buzz words in the investing community. The inherent value of a two-sided network can be expressed through the concept of what came first, the chicken or the egg? Nowadays, it is what came first, the Uber driver or the Uber user. Without users, no drivers will sign up to drive people and without drivers, no users will use the service. However, we live in a world with chickens and eggs and Uber drivers and users. So, how’d we get there? 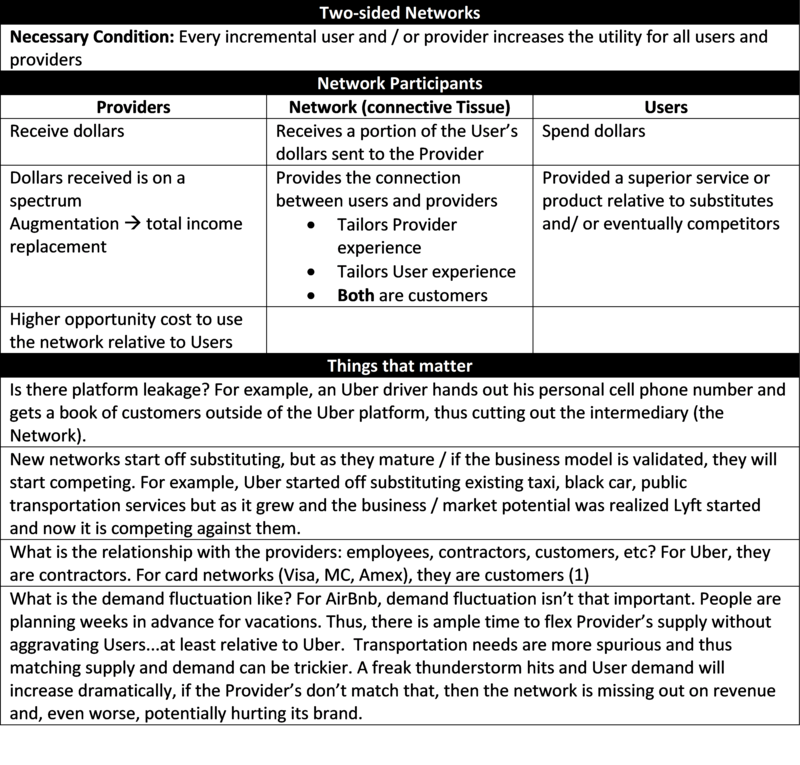 First, let’s more precisely define what a two-sided network is (and do away with the not so applicable chicken and egg conundrum). Put simply, a two-sided network is one in which every incremental user and / or provider increases the utility for all users and providers. Below are characteristics of providers, the network and users. T1 the connective tissue of the network is created. In Uber’s case, it is the app itself. Starting at Time 1 (with T0 being idea conception), let’s go through the major milestones. T2 the first user or provider starts using the network, and here is where we get back to the original question. For networks broadly, the provider or user with the greatest amount of reward to friction ratio comes first. In Uber’s case, what came first were the professionals already doing this job: taxi’s and black cars. The friction is signing up to the network and having the app running while they are currently doing their job and the reward could be significant. To further tip the friction/reward ratio, company’s trying to establish networks will subsidize. In Uber’s case, that means giving a sign-up bonus based on rides given. T3 is when the other side of the network starts using the network, too. To strengthen the network further, incentives will be given here, also. In Uber’s case, if you sign up you get a couple free rides. T4 the network is mature and there is no longer a need for subsidization. Pretty simple, right? Well, not really, there are a lot of questions that need to be examined. So, let’s start asking questions: How do you create the connective tissue? What should you focus on? How do you determine the friction/reward ratio? How much should a Company subsidize? What exactly does subsidizing mean in this case? How do you know when a market is mature and subsidization is no longer needed? I’ll answer these in a follow-up post. (1) Card networks, Visa, MasterCard, Amex, etc., are one of the first networks and immensely valuable. Unlike Uber, Handy, Ebay, AirBnB, etc. it is difficult to define who is the User and who is the Provider. I am inclined to say the Provider is the consumer and the User is the merchant. This is due to the merchant having to pay to accept credit cards (its merchant discount rate). Payments processing is a bit too complicated for this post, so I will leave it for another day.